Publish or perish—that’s the byword of academia. It holds true for the science and technology research in India as well, where quality has been sacrificed to boost quantity. As Mint reported earlier this week, India’s scientific publications grew 13.9%, as against the global average of 4.1%, between 2009 and 2013. These numbers are from the Elsevier Report 2016, a study commissioned by the Department of Science and Technology. The study looked at the publication output of researchers covered under Elsevier’s Scopus database, which covers 60 million documents published in over 22,000 journals, book series and conference proceedings by nearly 5,000 publishers. The study looked at the work of 366,455 active researchers who are working with or are affiliated to Indian institutions. But the growing share of world research paper output has not been matched by the impact they have had on scientific progress or commercialisation. One simple way to measure the impact of these papers would be to look at the number of times they have been cited by other researchers. 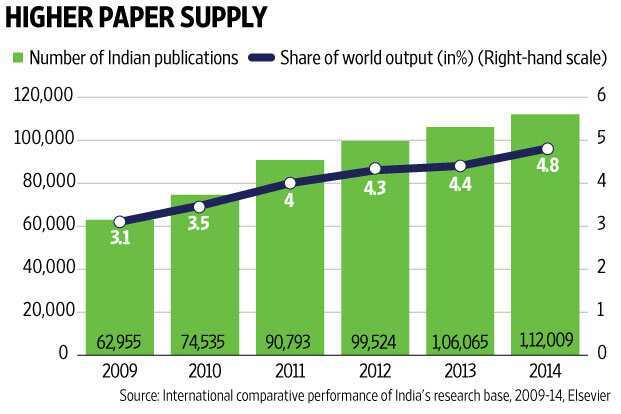 In 2013, India’s share of world citations was 3.4%, lower than its share of paper output at 4.4%. However, different fields of research have different citation practices. Thus, Elsevier uses a yardstick called field weighted citation impact, which looks at a paper’s citation compared to the average citations in that research field for a particular year. 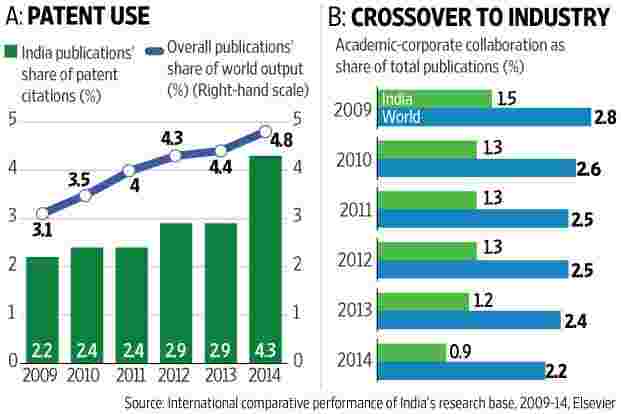 That too shows that Indian research papers are cited 25% less than the world average. 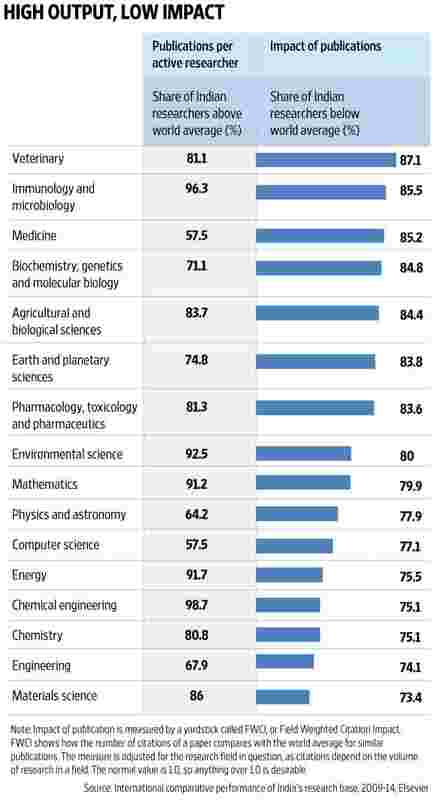 Chart 2 shows how in most fields of research while Indian researchers are prolific in paper writing—at least half of them in all fields have an output greater than the world average—they are ranked low in terms of impact. Anshul Kumar, a professor at IIT Delhi’s department of computer science and engineering, attributes it to a culture of publishing for the sake of publishing. “There is pressure to publish, but not much scrutiny of where papers are published. Since promotions are tied to the volume of output, academics feel the need to show published output, even if it is not in very well-known publications. Moreover, spending on research and development is low, and this further serves as an impediment to producing original research that has the potential to have a higher impact," he explains. Nirmalya Bagchi from Administrative Staff College of India said that low impact reflects the fact that entry barriers for publishing in prestigious journals are very high for Indian scientists. “A paper has a high impact when it is published in a prestigious journal, and it is difficult for an unknown researcher to publish in such places," he says. “Prestigious Western journals prefer to publish research from highly-ranked institutes, and it is well-known that most such institutes are in the West. Thus, Indian scientists who move abroad to work with well-known institutes do not face such difficulties in publishing. It also helps that the research infrastructure is well-developed abroad," he adds. India also doesn’t fare well when it comes to knowledge sharing. This is measured by the number of paper citations in patent documents as well as the number of collaborations between the industry and academia. However, collaboration between the industry and academia tends to happen when there is a scope for commercialisation of technology or industrial application; hence, it varies depending on the field of research. There are a couple of caveats to these findings though. One, the coverage of the Scopus database can’t be fully exhaustive and it might have left out some journals. Using citations as a measure of impact can also be problematic since these tend to accumulate over time and can have a skewed distribution. Two, averages tend to hide that some fields such as engineering (where the field weighted citation impact is just 6% lower than the world) are doing better than others. Consider this statistic: while India’s share of research paper output has grown by 13.9% in the period under review, its share of the top 1% cited papers has grown 20.8%. Similarly, its share of the top 5% cited papers has grown 15.4%. That shows that there is growth in scientific excellence and this growth is aggressive at the top end of the excellence scale, said Elsevier.